The Jorgensen 3/4" PRO pipe clamp fixture features wider and taller stance and jaws to get the most out of this clamp. A built-in stand and hanger make it a breeze to use and to store. Clamping jaws reach a maximum of 2-1/8" and the clamp sits 2-1/2" above the work surface. 1. Height - for all of my long clamps, half of them are this style with the built in feet. It allows full glue-ups without needed additional support under the workpiece, with plenty of room to twist the handle without hitting other services. 2. Stability - the legs are wide enough and strong enough, they don't tend to try and tip over like others I've had. Also - who can resit seeing that recognizable orange clamp hanging on the wall. These are great, and I will most likely be getting even more. I like the design better than others like the Bessey, because the legs on the sliding end of the clamp are a separate piece. I like the back feet being separate and free to slide to anywhere along the pipe regardless of where the clamp is. I can leave a longer pipe in the clamp all the time, even for narrower pieces. I use 3' pipes minimum. With other brands the back feet are part of the clamp itself. When you want to clamp something narrow, the feet are closer together. This leaves a long pipe sticking out the back, unbalanced, which can tip down and cause the front (crank end) of the clamp to rock up off the bench. If you want your work level, you may either have to shift to shorter pipe lengths for certain jobs, or place blocks under the pipes. As far as I'm concerned, that's why the clamps have their own feet. My glue-up bench is wide and level, and I can spread the feet to both ends of the pipe for all my glue-ups. So my work is always level and flat, if it's wide or narrow, and I don't have to mess around at all. This makes these clamps the best for the money from my perspective. The only gotcha: I ordered these in December of 2017 and received them in February 2019, a year and 3 months later. Grizzly told me they were backordered because the company wasn't producing them for a while. I chose to make do and wait for these rather than buy the alternatives. I don't know if Grizzly is ready to ship more at this point or not. They kept the item live on their website for over a year and ready for more orders even though they couldn't get them in stock. Maybe the company is producing them again. ? I purchased this product a month ago and so far I really like the clamps. Very well made and should last my life time! 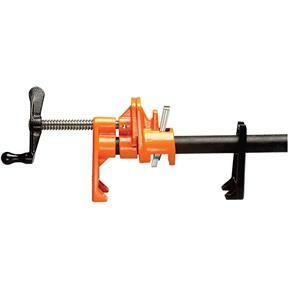 Great buy, this set of 4 T25356 3/4" Pro Pipe Clamp Fixture will receive many years of use!